The Netflix original “Alex Strangelove,” written and directed by Craig Johnson, is a coming of age movie that, made clear by the title, illustrates the many ways love comes about. Released April 14, the film tackles issues such as sexual orientation and acceptance – a common theme these days due to the overwhelming amount of progress made towards equality. The main character, Alex Truelove (Daniel Doheny), thinks that he has his whole life planned before him, but suddenly his entire world changes within the span of a few months. While planning on losing his virginity to his girlfriend, Claire (Madeline Weinstein), Alex meets the outgoing and spontaneous Elliot (Antonio Marziale) – causing Alex to rethink his relationship with his girlfriend as well as his sexual identity. Like most coming of age films, he goes through the motions: happiness, confusion, anger, sadness and then happiness again. The development of Alex throughout the movie is cliche, yet inspiring; expected, yet surprising. Alex starts off as the typical goofy and responsible nerd: class president, fun to be around and has an equally smart girlfriend. Throughout the movie, he acts within the moment and does not think about the consequences that could potentially occur – as most teenagers do – which causes him to have doubts in all of his relationships. His recklessness leads him to become a confused hormonal high school teenager that can’t figure out his place in life. However, towards the end of the movie, Alex finds himself reflecting on the choices that he has made and how they have affected his future. He begins to realize that everything happens for a reason, as well as finally being able to accept his identity, instead of denying it. The setting of the movie takes place in New York, following the characters from their high school, to their homes and to their events. Because it is a cliché teen film, Alex often finds himself at a party, but since he’s struggling with his identity he tries to conform into what his friends want him to do: lose his virginity to his girlfriend. The plot of the movie is – as you can guess – typical, conventional and cliché. Though the movie is quite formulaic, the topics that are being discussed and the comedic relief throughout the movie saves it from being another bland and disastrous movie. The casting of the movie was well done. Johnson included many different ethnicities and shows how love comes in all different shapes and colors. For example, Sophie Hicks (Annie Q.) and Dell (Daniel Zolhadri) are of two different ethnicities and are completely opposite of each other, but the movie is able to personify how an attraction between two people who are polar opposites can form over time. The way Johnson was able to show that love can form between two individuals – whether it’s the main character and his lovers or the secondary characters and their love interests – is what saves the film from becoming a movie that will be forgotten in a matter of a few months. The overall quality of the movie was good. Though “Alex Strangelove” is filmed in a studio for the most part, the movie was not surrounded in green screens the entire time like most films are. This allowed for the movie to have a more distinct feel to it, making it stand out more from a lot of the films that are being produced with higher budgets. Though it does fall into the more conventional teenage film, “Alex Strangelove” offers a love story like no other. The way Alex is able to finally come to terms with his sexuality, and the way that his friends show acceptance, is a unique way to explore how people struggle with their self identity. The movie allows the person watching to get lost in the love story and fall in love with Alex as he struggles to find himself. The most significant part of the film came when Elliot told Alex that “when you are in the moment, things just fall into place,” which can summarize the movie itself. 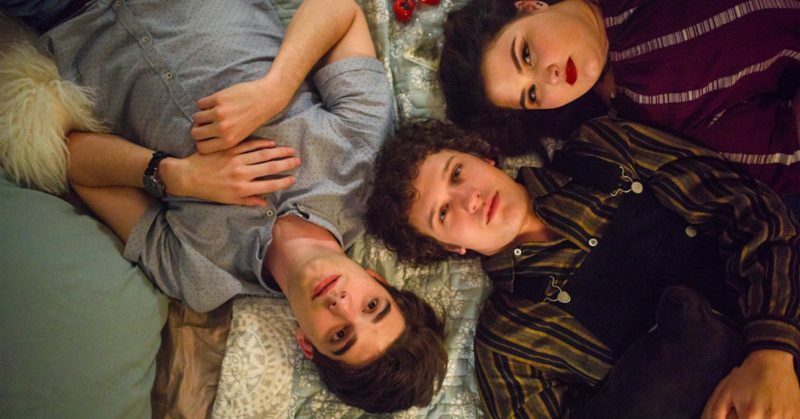 “Alex Strangelove” illustrates to its audience just how strange, and wonderful, love can be.